The Black Barred Convict Goby is also called the white tiger goby, circus goby, Ctenogobius nocturnus and full moon reef goby. Its official scientific name is Priolepis nocturnus. 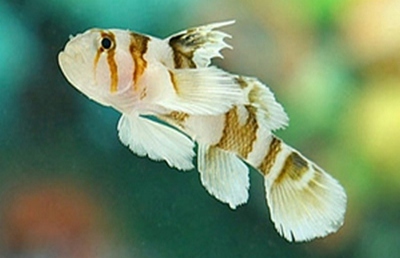 The fish has brown, tan or black vertical stripes on a white or light gray body, reminiscent of the historic criminal uniforms with black and white stripes like bars. Priolepis nocturnus is a carnivore. It is reef compatible, since it won’t eat the coral polyps or attack clams. An East Asia native that lives in the Indo-Pacific ocean, it is rather peaceful. It won’t bother other fish or invertebrates. It mostly feeds and rests. It sometimes swims within the rock face, occasionally even swimming upside down. It is only territorial towards others of its species. Feed the Black Barred Convict Goby brine shrimp, diced clam and mysis shrimp. You can also feed the goby Formula One fish food. Soak them in vitamin supplements periodically before feeding. They eat benthic copepods in the wild. In rare cases, the tank is large enough to generate enough food for the goby. However, you should plan on feeding them regularly. This fish doesn’t have an official fish food or universally recommended diet because it is relatively new to the aquarium trade. The Black Barred Convict Goby cannot share a tank with anglers, dragnonets or frogs, and exercise caution if placing them in a tank with large angelfish. They cannot share a tank with wrasse, squirrelfish, rays or sharks. In short, the goby is a small predator that is easily prey to fish large enough to eat it. You can put it in a 20 gallon tank, or a larger one. Ensure that the tank has lots of hiding places for the fish. These fish are one to one and a half inches in length, though a few specimens grow to two inches long. Their ideal water temperature is 75 F plus or minus a few degrees. The fish tank’s water hardness needs to be 8-12 dKH. Water sg should be 1.020 and 1.025. This fish is easy to take care of and suitable for beginners.